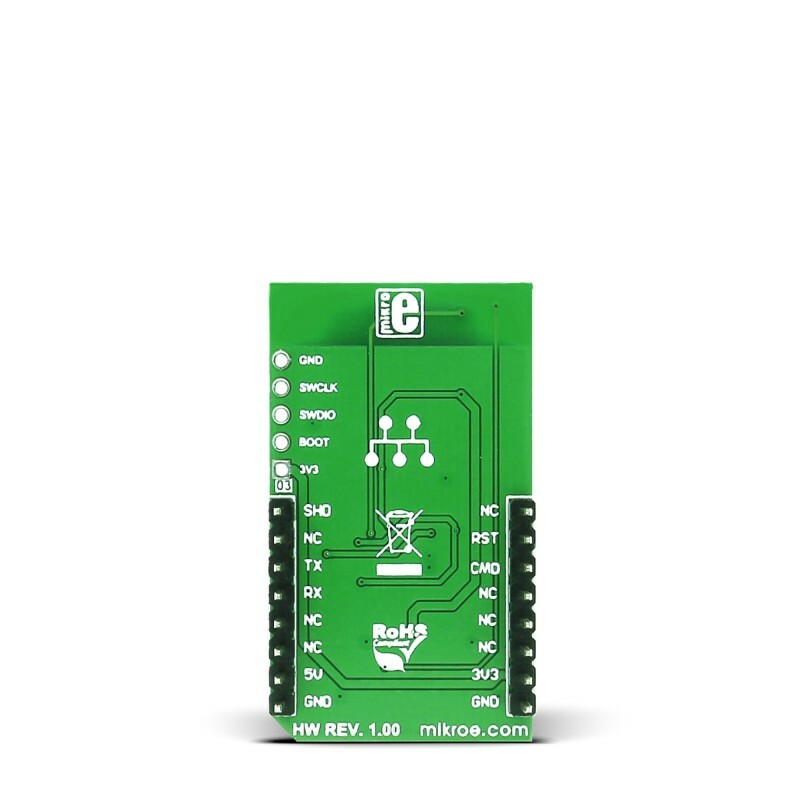 The board is designed to use 3.3V power supply and 3.3V or 5V I/O voltage levels. 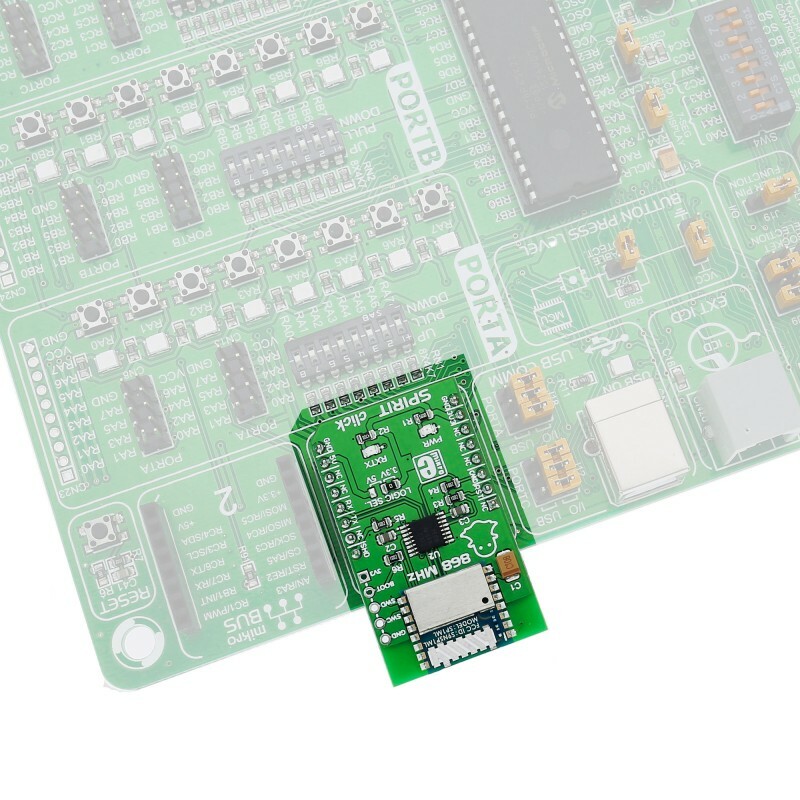 It communicates with the target MCU over UART interface, with additional functionality provided by the following pins on the mikroBUS™ line: PWM, RST, CS. 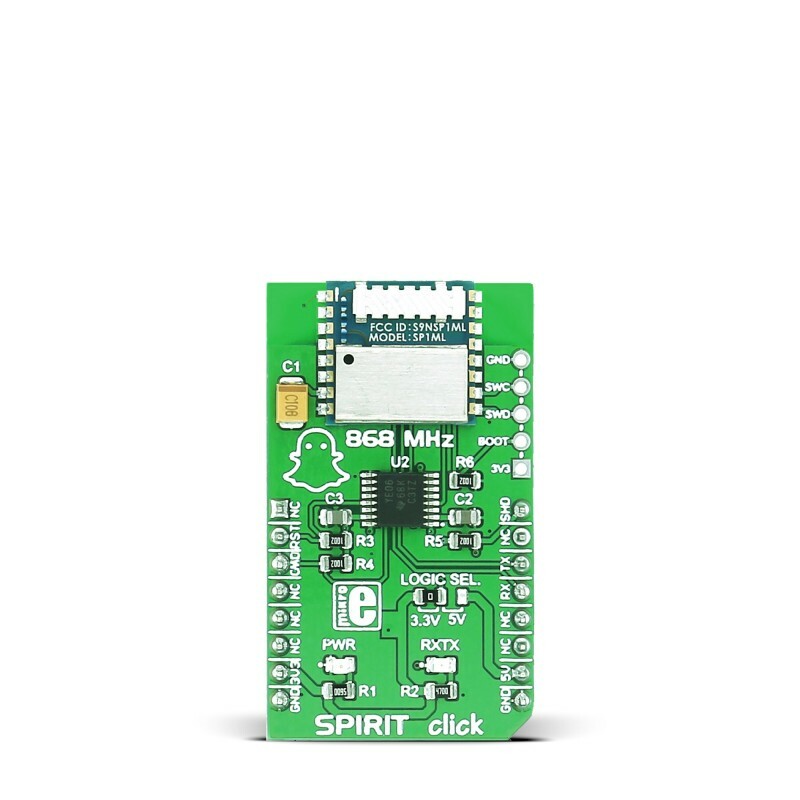 SP1ML is based on the SPIRIT1 RF sub-GHz transceiver (with integrated SMPS), STM32L1 microcontroller, integrated filter/balun, and chip antenna. There are two operational modes, command mode and operating mode. The command mode allows module configuration and status interrogation using an extended ‘AT’ style command set. In operating mode the module serves its primary purpose as a wireless transceiver. In operating mode the module uses only 13.5mA, 2.2mA in command mode, and even lower in stanby with just 1.4µA. This kind of power consumption makes it ideal for smart devices that send small amounts of data. The module has an integrated antenna and crystal. Applications Security systems, mobile health and medicine applications, IoT, wireless metering, etc. This table shows how the pinout on SPIRIT click corresponds to the pinout on the mikroBUS™ socket (the latter shown in the two middle columns). LOGIC SEL - used to select 3.3 or 5V logical level for UART communication (J1A in the schematic). Code examples for SPIRIT click, written for MikroElektronika hardware and compilers are available on Libstock. The library implements communication protocol between the MCU host and SPIRIT click module. It can work in two modes, command mode and operating mode. The command mode allows module configuration and status interrogation using an extended ‘AT’ style command set. In operating mode the module serves its primary purpose as a wireless transceiver. It uses asynchronous approach to issue commands and receive responses via callback functions. The code snippet shows an example callback function for the ATO command. It checks if the response is OK to change from library state to operating mode. Supported mikroC compilers for ARM, PIC32, PIC, FT90.